Abelson was born in 1913 in Tacoma, Washington. He attended Washington State University where he received degrees in chemistry and physics, and the University of California, Berkeley (UC Berkeley), where he earned his PhD in nuclear physics. As a young physicist, he worked for Ernest Lawrence at the UC Berkeley. He was among the first American scientists to verify nuclear fission in an article submitted to the Physical Review in February 1939. From 1939 until 1941, he worked as an assistant physicist at the Carnegie Institution in Washington DC. It was while he was here that he worked on a substance that emitted beta rays and was produced by irradiation of uranium with neutrons. 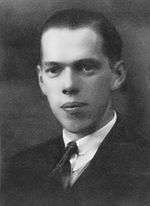 After he collaborated with the Nobel Prize laureate Luis Alvarez they isolated the material, and became the co-discoverer of neptunium on 8 June 1940 with Edwin McMillan. McMillan was awarded the Nobel Prize for this discovery among other elements. Abelson was a key contributor to the Manhattan Project during World War II, while working with the Naval Research Laboratory. Although he was not formally associated with the atom bomb project, the liquid thermal diffusion isotope separation technique that he invented at the Philadelphia Navy Yard was used in the S-50 plant in Oak Ridge, Tennessee; and proved a critical step in creating the large amount of nuclear fuel required for building atomic bombs. In 1946, he returned to work at the Carnegie Institution, and from 1953 until 1971 he served as the director of the Carnegie Institution of Washington's Geophysical Laboratory, and as president from 1971 to 1978, and as a trustee from 1978 on. From 1962 to 1984 he was editor of Science, one of the most prestigious academic journals, and served as its acting executive officer in 1974, 1975 and 1984. From 1972 until 1974 he served as the president of the American Geophysical Union. Abelson was outspoken and well known for his opinions on science. In a 1964 editorial published in Science magazine, Abelson identified overspecialization in science as a form of bigotry. He outlined his view that the pressure towards specialization beginning in undergraduate study and intensifying in PhD programs has the effect on students of leading them to believe that their area of specialization is the most important, even to the extreme of considering other intellectual pursuits to be worthless. He reasoned that such overspecialization led to obsolescence of one's work, often through a focus on trivial aspects of a field, and that avoidance of such bigotry was essential to guiding the direction of one's work. Abelson died on August 1, 2004 from respiratory complications following a brief illness. He was married to Neva Abelson, a distinguished research physician who co-discovered the Rh blood factor test (with L. K. Diamond). Their daughter, Ellen Abelson Cherniavsky, worked as an aviation researcher for the MITRE corporation in Virginia. 1 2 3 4 5 6 7 Hoiberg, Dale H., ed. (2010). "Abelson, Philip Hauge". Encyclopedia Britannica. I: A-ak Bayes (15th ed.). Chicago, IL: Encyclopedia Britannica Inc. pp. 26–27. ISBN 978-1-59339-837-8. ↑ Philip Abelson (1939). "Cleavage of the Uranium Nucleus". Physical Review. 55 (4): 418. Bibcode:1939PhRv...55..418A. doi:10.1103/PhysRev.55.418. ↑ Philip H. Abelson (1964). "Bigotry in Science". Science. 144 (3617): 1964. Bibcode:1964Sci...144..371A. doi:10.1126/science.144.3617.371. PMID 17799957. ↑ Philip Abelson (1965). "Paleobiochemistry". Scientific American. 195 (1): 83–92. doi:10.1038/scientificamerican0756-83. ↑ Philip H. Abelson (1985). Enough of Pessimism. American Association for the Advancement of Science. ISBN 0-87168-274-5. ↑ Milton, Charles; Dwornik, Edward J.; Estep-Barnes, Patricia A.; Finkelman, Robert B.; Pabst, Adolf; Palmer, Susan (September–October 1978). "Abelsonite, Nickel Porphyrin: A New Mineral from the Green River Formation, Utah" (PDF). American Mineralogist. 63 (9–10): 930. Kennedy, D (2004). "In memoriam. Philip Hauge Abelson, 1913-2004". Science. 305 (5685): 765. doi:10.1126/science.305.5685.765. PMID 15297640.